Dominique Crenn reposted this photo of ours on Instagram, and we can basically die happy now. Atelier Crenn has two Michelin Stars. It should have three. It was left off of this year’s World’s 50 Best Restaurants list, and it should have placed in the top ten (we have eaten at four of the top ten—including number one—so we are not speaking from ignorance). The world of fine dining is still in many respects a “boy’s club,” and we believe Dominique Crenn’s culinary artistry has not yet received the recognition it deserves. Scallionpancake is here to change that. We are going to go a step further, in fact: Crenn’s dishes are more inventive, more flavorful, and, most importantly, more reflective of her passion than those we tasted at EMP and The French Laundry. At the aforementioned restaurants, we felt that the chefs were resting on their laurels and relying on their famous names in many respects. Perhaps because Crenn’s reputation does not yet precede her, she is making food that keeps diners on their toes and showcases a cuisine that blends creativity and taste in a way that places her quite firmly in our top five restaurants (she is still below Noma, but not far below). Soooo excited. And perhaps a bit underdressed. But San Francisco is a walking town, and we definitely walked to dinner. Hence the sneaks. If you’ve seen the Netflix Chef’s Table episode on Atelier Crenn, you know that Crenn created her Marina District San Francisco restaurant as a tribute to her father, Allain. Together with her mother, he introduced Crenn to a wide variety of cuisines at a young age. In her 20s, Crenn moved from France to San Francisco to begin her restaurant career. In 2011, she opened Atelier Crenn and received two Michelin Stars that same year. In 2015, she opened the smaller, slightly more casual Petit Crenn, and this year she opened Bar Crenn right next door to Atelier Crenn, which serves wine, cocktails, and small plates. 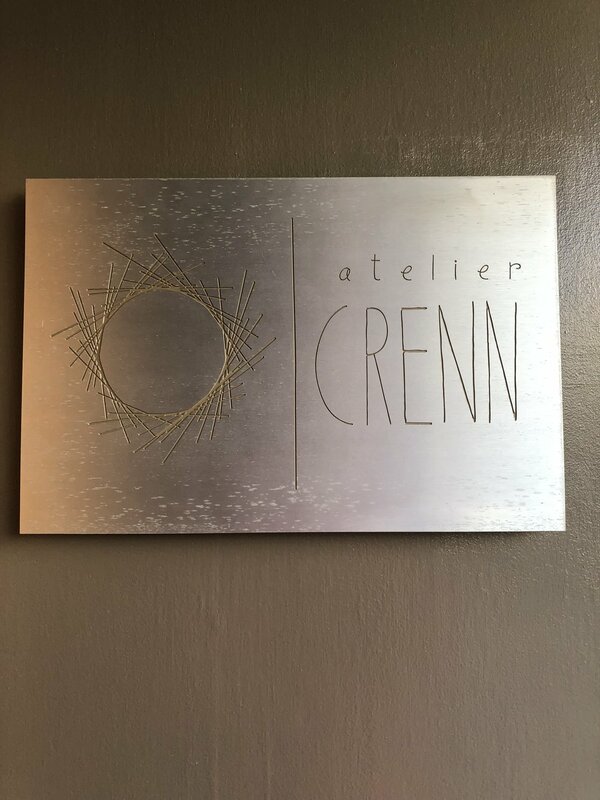 In 2018, Crenn won the James Beard Award for Best Chef in the Western Region of the United States. 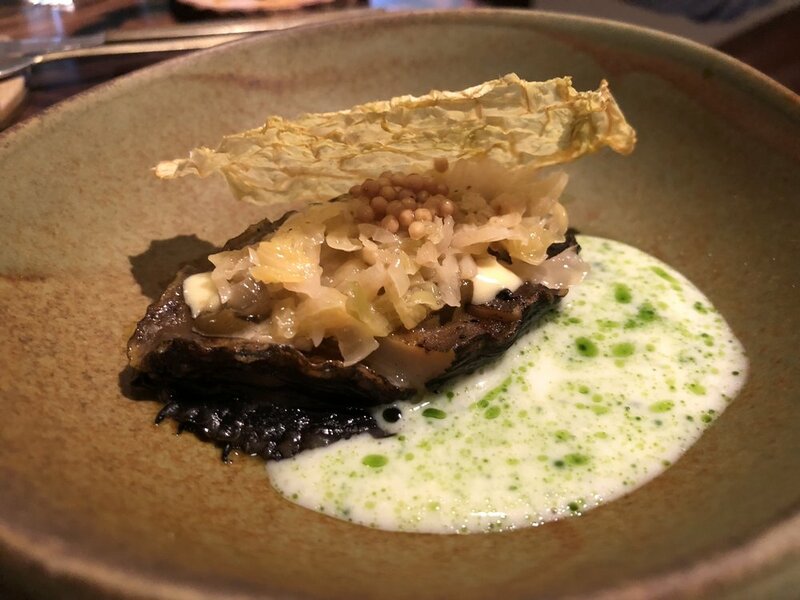 We dined at Atelier Crenn in May 2018 and enjoyed the spring tasting menu. We didn’t see Crenn on our visit, as she was on vacation, but she is in the restaurant most nights of the week, so you are likely to catch a glimpse of her in action when you go. Once seated, each diner is presented with a poem that is a menu in disguise. Each line is a coded lyrical verse that hints at the dish to come. We had so much fun trying to figure out what type of dish was coming based on the poem, though we only guessed correctly for a couple (we knew the “Royal Lady’s fruitful labor” was referencing a honey bee. That’s about it). Okay, okay, The first course doesn’t correspond to the poem. But the kombucha apertif was a delight. Delicious, cool, and refreshing. The first course that corresponds with the poem. If you’ve seen the Chef’s Table episode on Crenn, this dish features prominently. The ingredients in a Kir Breton cocktail (crème de cassis and dry cider) are enrobed in white chocolate. You pop this in your mouth all at once, and the cool and sweet flavors explode. Such a strong start, and it deserves its place as Crenn’s signature dish. Have you ever had geoduck? We hadn’t. It’s a large clam, portioned here along with the sea urchin to look like a beautiful flower of sorts. The texture of the clam and sea urchin on the rice cracker was divine. This came out in a cloche filled with dry ice, so the presentation was as exciting as the taste. The most exciting thing about Crenn’s food is the way she plays with textures and flavors. Each bite feels unexpected, and there are approximately 35 experiences happening at once inside of your mouth. That’s what she said? The circle of consommé and the inner circle of whey each added layers of flavor to this dish. Smoked buckwheat, quinoa soil, smoked trout roe (bottarga), and smoked sturgeon pearls with a warm bonito dashi broth. This course was rich and comforting. One of our favorite dishes. Early spring peas were mixed with beads of frozen crème fraîche. Tableside, ham broth was stirred in. This was spring in a bowl—the flavors were bursting with freshness and the mix of crunchy textures made every bite a revelation. Caviar and gold leaf: how could this be bad? Served with lacy buckwheat crackers, this course was fun to eat and the flavors were perfectly rich. Alternate verse: Brioche with butter? Enough said. Another one that is not part of the poem, but wow, wow, wow. I love the radish, butter, and salt combo, but Crenn took it to a new level by enrobing the entire radish in the slightly sweet butter. Every other butter/radish duo will pale in comparison to this. This was one of the only dishes we weren’t floored by. We liked it, but it wasn’t super memorable. Moving along. The best part of this course was that you got to choose your knife from a box of assorted knives a waiter brought around. I always loved '“choose your own adventure” books, but choose your own cutlery was nearly as fun. You may have noticed that there is no meat on this menu. Once we had this course, I wasn’t missing it at all. The sea bass was meaty and so rich. I felt very satisfied, but Jason wouldn’t have hated a bit of red meat. Matcha mixed with bone broth. Could Crenn get any more au courant with this course? I dug it. A more creative palate cleanser than stodgy old sorbet, thats’s for sure. A very satisfying and warming cheese course. Not a standout when looking back at the entire meal, however. The verse we guessed! Honey! The bee pollen magic shell on the honey ice cream was super fun and majorly tasty. A rich, creamy, dreamy, coconut pineapple mousse inside of a chocolate shell. In Scallionpancake’s opinion, the dessert course is a major weakness at many fine dining restaurants (we’re looking at you, EMP), and Atelier Crenn’s offerings blew us away. This coconut had so many lovely texture and flavor elements (chunks of pineapple are hiding inside of the mousse), and the portion was large enough to leave us satisfied. This dessert was the absolute best we’ve had anywhere. A real cacao pod! What could possibly be inside?! An assortment of fabulous chocolates, that’s what! My favorite was the peanut butter one on the right—it was essentially a next level PB Crisp (PS-sign the petition to bring back PB Crisp! It’s my life’s cause). Neither of us did the beverage pairing, but we each got two drinks. Jason enjoyed mocktails, while I indulged in the most glorious champagne. Cheers! Tasted just like a real G & T. Seriously amazing. Stocked by the Seedlip brand. Crenn’s father’s paintings adorn the walls, along with sticks and other natural elements. The entire effect is that you are dining in a cozy bird’s nest. Cozy, indeed—there are only eight tables, making this the smallest fine dining restaurant we’ve ever experienced. The service throughout the night was flawless, and the servers were very patient and when we asked them to repeat explanations for each dish. Because you know we did. There was only one snafu, and perhaps this reflects poorly on us, but we feel that Scallionpancake readers deserve to know our truth: we are pen stealers. Gulp. When we dine in fancy, Michelin-starred establishments, we hope and pray that we get a branded pen with our bill (note: even when you pay ahead of time with Tock, you still must pay for drinks the night of), and when we do, well…we take that pen and put it in a v. special faux marble jar from The Container Store. Like ya do, right? Well, Atelier Crenn is the only time we have been called out. When the waiter came back to get our bill after we had signed, he looked inside the envelope and asked if we had the pen! Yikes. We owned up, and said that we were pen collectors (read: thieves), and laughed it off. He wasn’t laughing, but he let us leave with out absconded pen nonetheless. Though we should perhaps feel shamed, we only feel that for a $700+ meal, it really shouldn’t have been mentioned. Since we are talking cash money, let’s get into the details. Like Eleven Madison Park, Atelier Crenn uses the Tock booking system, which means that diners pay for their meals in advance. We love this feature, as paying for the meal on the night of can be a bit of a downer, so it’s nice to get that pesky part out of the way ahead of time. At the time of publication, each tasting meal is $335 per person, with the tip included. Beverage pairings begin at $220 per person. Okay, so this is not the outside of Atelier Crenn. But this amazing house nearby caught my eye. It’s a hindu temple with a very cool history. The more you know! Don’t worry, the fabled pen is resting safely on our kitchen counter in its faux-marble home; We will let you come see the pen for $335 per person; We are writing sternly-worded letters to the folks behind the 50 Best Restaurants List, and we are going to sign them all “#MeToo""; Our friend Miriam, who is a mourning dove, dined in a nest every night until she was scared off by a giant raven who ate her bird children; I am currently writing a “choose your own adventure” book that is all about choosing the knife that will ultimately decide your destiny and success fighting against large, chocolate-shell coconut.